Sonnet’s Qio offers Mac and PC cross-platform compatibility, extending its usefulness on location and in the studio with an interface card or adapter designed specifically to connect Qio to the platform of your choice. Whether you’re using a Mac® with Thunderbolt™ or Thunderbolt 2 ports, or a PC desktop with PCIe® slots, Qio fits seamlessly into your demanding production workflows. With the appropriate Qio interface card installed or adapter connected, you can move the Qio reader back and forth between a PC and a MacBook Air® or MacBook Pro® (or any other Mac with Thunderbolt ports). You can also migrate your Qio reader from a legacy Mac Pro to the new Mac Pro cylinder using Sonnet’s Qio Thunderbolt Interface Adapter Kit*. Fast—Uses PCI Express® bus interface to deliver superior performance; aggregate bandwidth of 200 MB/sec. Small and Rugged—Strong aluminum case measures just 5.9" x 6.2" x 1.22"
Qio is available with your choice of a PCIe 2.0 interface card for PC desktops, or a Thunderbolt adapter (with included Thunderbolt cable) for any Mac with a Thunderbolt or Thunderbolt 2 port. For desktop use, a universal 12V output AC power supply (with wall plugs for US, Japan, Europe, UK and Australia) is included. For battery-powered operation during fieldwork, Sonnet’s optional XLR 4-pin adapter cable interfaces Qio with an external battery pack, such as Tekkeon’s myPower ALL batteries at an 8-19V setting. Alternatively, you can power the Qio by connecting it to a computer with a FireWire port with Sonnet’s optional FireWire 400-to-3.5mm power cable. Qio includes four eSATA ports, perfect for connecting media readers with eSATA interfaces, such as the RED STATION REDMAG 1.8" and 2.5". 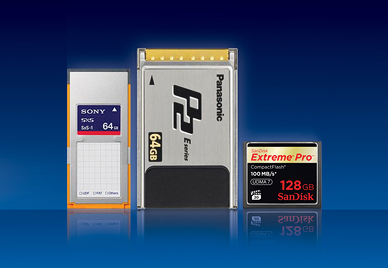 Qio supports a full range of media cards such as (from left to right) Sony SxS, Panasonic P2, CompactFlash (and XQD; not shown, adapter sold separately) cards. The Qio pro media reader is small—about the size of three stacked CD cases—and takes up so little space, you can use it just about anywhere. It’s rugged, too—the robust aluminum case easily withstands heavy use. This pro media reader even incorporates a slot for Kensington® and similar security locks to secure the device and deter theft. *Qio Thunderbolt interface adapter not compatible with PCs. Qio PCIe card or ExpressCard adapter not compatible with OS X after Version 10.9.5. Media cards, computers, and accessories shown in photos for illustration purposes; items sold separately. External Media Readers Supported Four with eSATA interfaces, such as RED STATION REDMAG 1.8" or 2.5"
Panasonic P2 Driver not compatible with Windows 10. This is one fast device. If you have lots of media to off-load and backup it’s going to save you a lot of time. If you are a production company that works with large volumes of solid state media it will pay for itself very quickly in saved man-hours. If your working in the field with a MacBook Pro the ability to connect both the media and eSATA devices at the same time makes the QIO a very interesting proposition. It is well constructed, simple to install and use, what more could you ask for." Who needs the Qio? Any editor who deals with a variety of solid-state media. Nothing is worse than having a client drop off a P2 card and you have no way to read it. “Er, can I plug your camera into my computer so I can copy the contents of the card?” Or, “I know I have that little USB CF card reader somewhere around here…” And it’s not just for editors needing multiple formats. A solid piece of equipment to me is far preferable to an inexpensive card reader which might be slow and much more subject to failure when you need it most. The Qio is most useful to anyone who needs to extend the bus capability of their computer to additional storage and other compatible card-based devices. The Qio represents the only product of its kind on the market and I am pleased to recommend it with great enthusiasm." "…The single most impressive ingest product that I saw was the Sonnet Technologies Qio, pronounced Cue-Eye-Oh. Using a single PCIe slot, it gives you two P2 readers, two Sony SxS readers, and two CF Card readers. My first reaction was, "It takes up another card slot?!? What if you need a slot for a SATA card?" The Sonnet Qio also incorporates the well known E4P eSATA card - built right into the Qio! So in addition to everything else, you get four eSATA ports, all of which support port multiplication for your eSATA drives. Amazing!" "As a solid-state card reader, the Qio accepts every kind of card your cameraman may hand you: P2 cards from Panasonic cameras, CompactFlash cards from digital SLRs or Red cameras, SxS cards from Sony, JVC cameras, and SDHC cards (via an adapter) from everything else. This versatility is a big deal. As many folks move from tape to solid-state, they can buy one convenient reader that handles it all. Not only does the Qio work with all of these card formats, but it accepts two of each card at a time — two P2 cards, two SxS cards, and so on. It’s like the Noah’s Arc of card readers, and that’s helpful if you’re shooting a lot of cards during the day, and want to copy two at a time. With two cards mounted, you don’t have to hover around your computer as it copies, waiting to slip in the next card. It’s a nice convenience, and no other card reader gives you dual-slotted options for so many media formats. …[its] a great option for production houses, editors and DITs who have to make their way in this world of endless media formats."